Business to Arts in partnership with the Creative Ireland Programme’s National Creativity Fund announced that they are seeking expressions of interest from businesses that would like to develop new (or significantly enhance their existing) CSR activity through the AR Programme. “The National Creativity Fund enables the Creative Ireland Programme to activate, enable and support a range of innovative initiatives which have creativity and wellbeing at their centre. 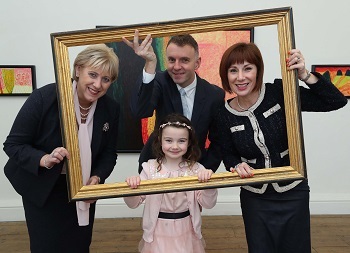 As a Programme which has collaboration and community engagement at its core, I am particularly pleased that this initiative of Business to Arts, which encourages and enables active partnerships between business, artists and local communities, is one of the priority initiatives of the Creative Ireland Programme in 2019. FAQ’s and application details can be accessed here. Today, Dublin Airport and NCAD have announced that artist Deirdre Byrne, a NCAD graduate has been selected to have her artwork displayed at Dublin Airport. 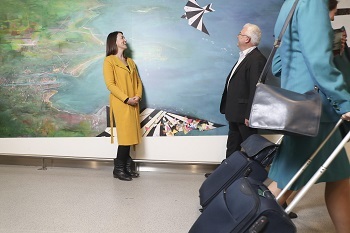 The work, ‘High Flyers’ which is displayed on a 7m x 2m billboard at one of Dublin Airport’s boarding gate piers, is part of a partnership between Dublin Airport and NCAD known as Creative Journeys. Dublin Airport held an open call this summer inviting anyone to submit a piece of work which would be displayed in Dublin Airport over 1 year. Over 100 entries were received. Supported by Business to Arts, the Creative Journey’s partnership will deliver a full public art programme at Dublin Airport over the next two years. Seven sites have been chosen across the airport campus to host works within Creative Journeys. The sites are located in landside and airside areas to allow both departing and arriving passengers to view the works of art. This enables members of the public who are at the airport but not travelling to view some of the installations. For full details see below. For our final 30th Anniversary event, we collaborated with TileStyle our long-term patron. This event included performances by Rory Nolan, Clare Monnelly & Jamie O Neill and bass-baritone Padraic Rowan. Guest were taken on a theatrical promenade through the TileStyle showrooms with each performance located in a different section – bathrooms, wood rooms and stone rooms. Introduced by Tony Award winning, Artistic Director of Druid, Garry Hynes, Rory read a emotive excerpt from Tom Murphy’s ‘A Whistle in the Dark’. This was followed by beautiful performances of ‘Non piu andrai’ from Le Nozze di Figaro and ‘The Lark in the Clear Air’ by Jim McNaughton/TileStyle Bursary winner, Padraic Rowan, accompanied by Mairead Hurley. 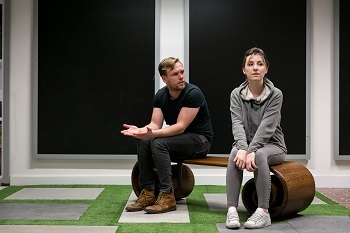 Our final performance of the evening saw Clare Monnelly and Jamie O Neill perform scenes from ‘Minefield’, a new work by Monnelly who is also a past McNaughton/TileStyle bursary winner. “My sincere thanks to all our performers and contributors tonight to Gary Hynes and Rory Nolan and the team at Druid Theatre Company and to the talented Clare Monnelly and Padraic Rowan. For me, Rory’s reading from ‘A Whistle in the Dark’ is particularly relevant. The play was written and developed between 1959 – 1961 by Tom Murphy and made the audience think about the impact of power structures on Irish society at the time. Move forward almost 60 years and the arts and cultural industry continues to refocus our attention on the importance of diversity, inclusion and equality in modern Ireland. Over recent years, the Business to Arts team have been proud to support initiatives such as Waking the Feminists, Women on Walls, Gaze Film Festival by securing financial and other supports to develop their mission’s and to make Ireland a more inclusive and equal society. As you may know, this year is Business to Arts 30th Anniversary year and we have hosted a range of events in corporate settings. 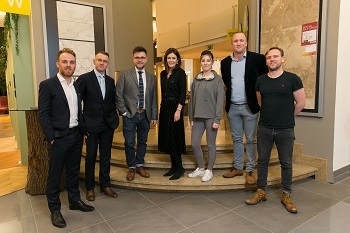 For this our final event of 2018, a special thanks to our hosts, TileStyle and our Chair, Ger McNaughton, Michele, Robin, JP and Ruth for everything they do to support Business to Arts. I also feel it is important to remember our former Chair Jim McNaughton. I did not meet Jim, but everyday, I am reminded of his impact on and importance to Business to Arts. Business to Arts’ next member’s event will take place on February 6th at 14 Henrietta Street.